Released on Universal International on May 22, 2006 (Europe only). Available on CD and mp3s. Contains 15 previously released tracks and 3 new tracks. Nine years after he last put made an album (1997’s Wildlife Dictionary) and 14 years since he was able to put a record out in the United States (1992’s Don’t Call Me Buckwheat), it’s good to hear from Garland Jeffreys regardless of the circumstances, and while it’s hard not to wish there were more than three new songs on I’m Alive, the record (as its title suggests) is a welcome reminder of a potent talent who has been flying under the radar far too long in America. 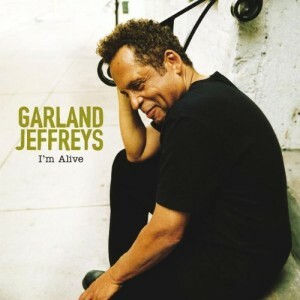 I’m Alive is a de facto “Best of Garland Jeffreys” collection, featuring 15 classics from his back catalog along with three songs original to this album. While this set doesn’t represent every album Jeffreys has made since launching his recording career in 1970, I’m Alive effectively skims the cream of his music, and great music it is. As a songwriter, Jeffreys is one of those rare rock & roll wordsmiths whose best work reveals a genuine poetic sensibility without falling prey to pretension; there’s a healthy portion of street soul and gritty, hard-won gritty wisdom in Jeffreys’s music, while his views on love, art, race, and the world around him are smart, passionate, sensuous, articulate, and alive to the thrill of discovery that’s part of the creative process. And Jeffreys is a powerful, expressive vocalist who can belt out rock & roll or groove on Latin and reggae rhythms with equal effect. While Jeffreys has made a handful of good albums and at least one great one (1981’s Escape Artist), I’m Alive is the all-killer, no-filler collection Jeffreys’ admirers have long been waiting for, with the three new songs (all top-shelf work) accompanied by such overlooked classics as “35 Millimeter Dreams,” “Wild in the Streets,” “R.O.C.K.,” “Don’t Call Me Buckwheat,” “Spanish Town,” “I May Be Your Kind,” and plenty more. If you’re not familiar with the work of Garland Jeffreys, I’m Alive is a superb introduction to a superb and wildly underappreciated artist. If you’re already a fan, savor those fine new numbers, enjoy the classics, and hope Jeffreys is good to his word about visiting the studio more often in the future.